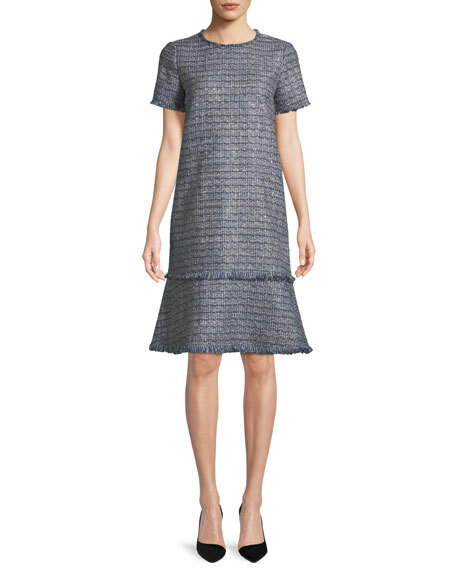 Lafayette 148 New York "Saria" dress in exhibition tweed. For in-store inquiries, use sku #2461811. 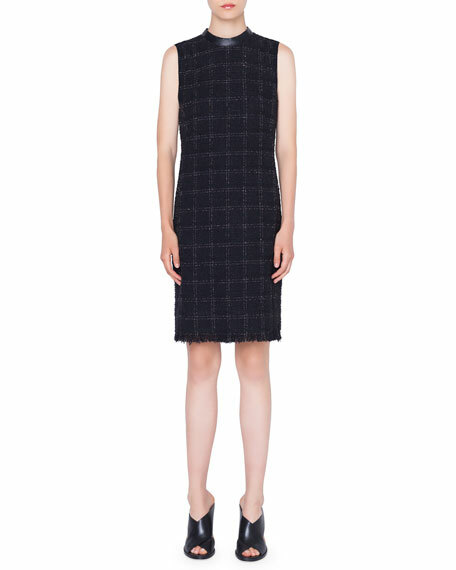 Akris punto dress in checkered cotton tweed, featuring faux-leather trim. Mini stand neckline. Sleeveless. Seam zip pockets. Shift silhouette. Fringe hem. Back zip. Cotton/polyester/acrylic. Lining, viscose. Imported. 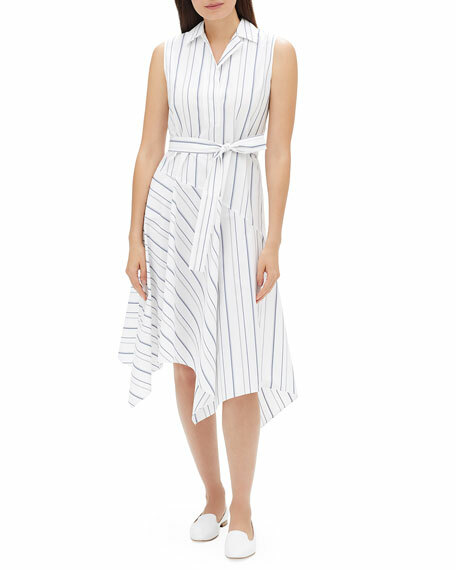 Lafayette 148 New York "Dandy" solstice striped shirt dress. Notched collar. Sleeveless. Self-tie waist. A-line silhouette. Midi length. Asymmetric flounce hem. Slipover style. Cotton/polyester. Imported. 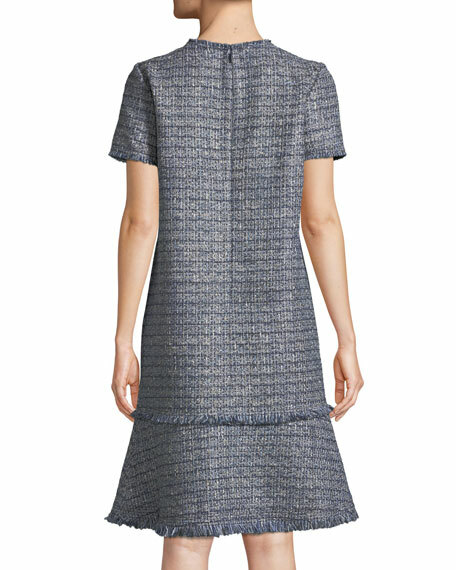 Lafayette 148 New York "Emory" dress in finesse crepe. Approx. 37.5"L from shoulder (size M). Bateau neckline. Long sleeves; bell cuffs. Shift silhouette. Straight hem. Back zip. Acetate/polyester. Polyester lining. Dry clean. Imported. 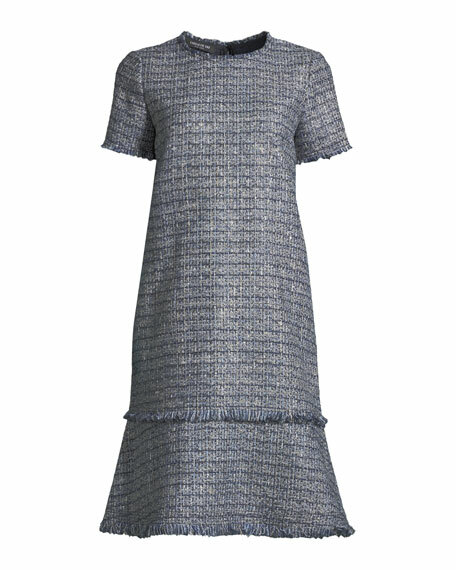 Lafayette 148 New York "Josefina" dress in velvet. V neckline; plunging back with brass chain. Long sleeves. Blouson bodice. Sheath silhouette. Pullover style. Knee length. Rayon/silk. Dry clean. Imported.